Unanswered questions still surround the mass shooting in Las Vegas on October 1 this year. Days after shooter Stephen Paddock killed 59 people and injured over 500, confusing details emerged. Journalists sparred with police at press conferences, grappling for missing details. The security guard who discovered Paddock in his hotel room with 24 guns and was shot by Paddock later disappeared, only to reemerge as a guest on the Ellen DeGeneres Show. 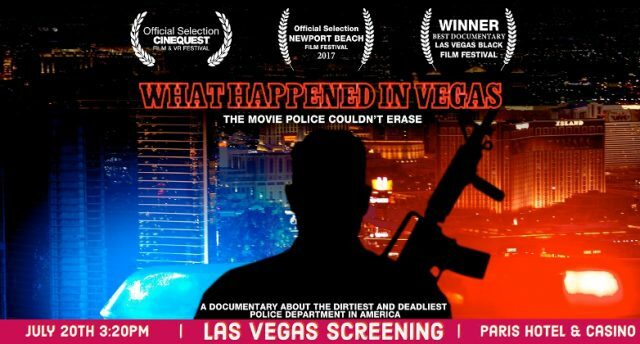 To shed light on this confusion, a new film, “What Happened in Vegas,” explores the role of the Las Vegas Police Department after the mass shooting. In short, there’s plenty of evidence to suggest coverups and corruption, as well as repeated police brutality within the force. At the root of the problem, the film explains, is that the LVPD is run by a sheriff elected in large part by donations from MGM, the corporation that runs the Mandalay Bay hotel. According to the documentary, Las Vegas police changed their story multiple times on the timeline of the shooting. One important detail the police lied about in several instances is the timing of Paddock’s shooting of security guard Jesus Campos. Why? It’s likely that the LVPD wanted to help the casino’s legal case, and if they claimed Campos was killed while trying to prevent Paddock’s rampage, as opposed to during or after, it could help the casino’s lawyers later claim that the Mandalay Bay had taken sufficient action to stop him. At least seven news organizations have since sued the LVPD for failing to release all the information from the night of the shooting, including the New York Times, the Associated Press, ABC, the Washington Post and the Los Angeles Times. The documentary also suggests that if the police and casino had acted differently, the mass shooting might have been avoided. An exclusive clip, below, reveals a little-known piece of the story of what happened in Las Vegas earlier this year. As Stephen Stubbs, an attorney working on behalf of the victims, explains, casinos like the Mandalay Bay have a “special back number” to a private wing of the police department which they use to alert the police of possible criminal activity within their casinos involving high rollers. Paddock was a regular at the casino, and known to be a highroller by the hotel’s staff, so the Mandalay Bay didn’t call 911 when Paddock shot Campos. They called the back line instead, and the operator didn’t link the shooting of Campos to the cascade of bullets pouring out of Paddock’s hotel window onto the Route 91 music festival.